RBTH presents a selection of views from leading Russian media, featuring reaction to the Ukrainian Army’s seizure of rebel-held towns in the country’s east and news of operations to identify militia sympathizers in Slavyansk following the city’s recapture, as well as speculation on the future of the so-called “New Russia” project in Ukraine’s southeast in the light of Russia’s apparent withdrawal of support. Nezavisimaya Gazeta writes that the Ukrainian government is to consider a plan to reconstruct the ruined cities in the Donbass. So far, the plan includes settlements from which the Ukrainian army ousted pro-autonomy militia forces over the weekend. Currently, the conflict around Donetsk and Lugansk continues, the newspaper reports, and the outcome of this confrontation is not yet clear. The publication also notes that the contact group that includes representatives from Ukraine, Russia, and the OSCE agreed on the need for a plan to immediately settle the conflict in a peaceful manner at their last meeting. However, the countries still cannot agree on a common vision of a “peaceful resolution.” Kiev demands that the militias lay down their arms, but the leaders of the self-proclaimed republics demand that Kiev withdraw all Ukrainian troops from the regions. “The federalization compromise proposed by Russia does not suit either side of the conflict, and the European Union and OSCE have limited themselves to calls for peace,” sums up Nezavisimaya Gazeta. 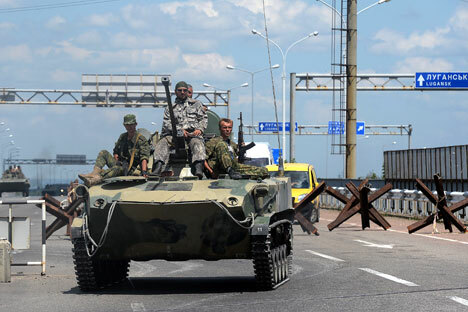 Vzglyad writes that indiscriminate raids have begun in captured towns in eastern Ukraine. After resting over the weekend, Ukrainian troops commenced “filtration activities” on Monday, the publication reports. According to some information sources, the entire male population of these towns is subject to inspection aimed at determining whether or not they aided the terrorists and took part in terrorist activities. According to Vzglyad, local residents have confirmed this information. In Slavyansk, the Ukrainian forces have started to arrest those who are suspected of collaborating with militia forces. “The Russian patriot is confused. First, Vladimir Putin recalled his mandate on the invasion of the neighboring state, and now troops have been withdrawn from Slavyansk, the city that served as the symbol of the pro-autonomy militia forces. How does one explain what's happening in the potential New Russia to the Russian public?” wonders Gazeta.ru. According to the publication, there are three main options. The first, the newspaper reports, is that nobody has betrayed anyone and the militia forces will still be victorious. "The essence of this version is that there is a strengthening of defensive force in Donetsk and Lugansk, and that the Ukrainian army will suffer greater losses if it goes on the offensive there," the publication emphasizes.